If you are looking for a Bridal Fair or Wedding Expo to start or finalise your wedding plans then you can’t afford to miss the Our Wedding Expo for the Hunter / Newcastle / Central Coast regions. The wedding season is in full swing, and there is no better time to check out the most prominent wedding specialists. A Wedding Expo is the perfect opportunity for Brides to ensure that their wedding day is everything they ever dreamed, and more. Exhibitors are on-trend and full of innovative ideas, and all guests are privy to a plethora of ‘on the day’ specials to place the wedding of your dreams within reach. Brides and grooms alike will draw inspiration from each stall as they wander through the Wedding Expo, broadening their minds to each and every opportunity available to them. So why not make a day of it? 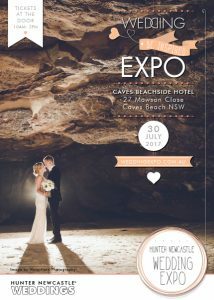 The Wedding Expo isn’t for brides alone, so bring along mothers, sisters, bridesmaids or even the groom! Have a wander and gather advice from the Region’s most outstanding wedding specialists, as they demonstrate the abundance of products and services available to you for your wedding day. We will be there and we’d love to meet you and see how we can bring the fun to your special day.